The CERT Coordination Center (CERT/CC) has released information on a vulnerability in Windows Address Space Layout Randomization (ASLR) that affects Windows 8, Windows 8.1, and Windows 10. A remote attacker could exploit this vulnerability to take control of an affected system. US-CERT encourages users and administrators to review CERT/CC VU #817544 and apply the necessary workaround until a patch is released. How to fix this vulnerability? To deploy this registry setting on single computer, just double click on this file and Say Yes if prompted. 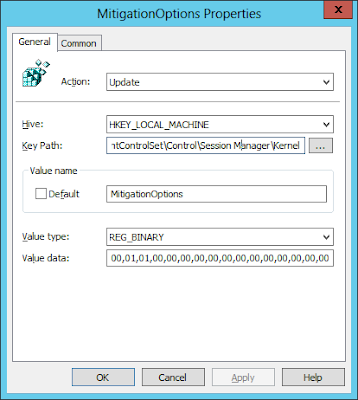 You can use the same registry key values in GPO to apply it on multiple domain computers. Cheers, let me know if you have any query of feedback on this..